The most important type of tort to understand in sports risk management and sports law is negligence. Negligence is conduct that falls below a reasonable person standard. In other words, it is the failure to exercise reasonable care that a reasonably prudent person would have in the same or similar circumstances. This standard applies to acts as well as omissions. How to Know When You Need to Call a Lawyer! Shelley Timms, B.A., LL.B., LL.M. Liability issues are faced by everyone. It does seem that there are more lawsuits and more ways to be sued but some of the risks have not changed. For the Student Union Manager, there will always be students, some considered to be ‘children’ in the eyes of the law; there will always be those who want to take risks; and there will always be alcohol (and drugs). The following is a primer on some of the basics to keep in mind when planning activities with the Student Union (SU) Board and running the Union. Acknowledging the most feared four letter word in Campus Recreation is the first step in understanding it : R-I-S-K.
Risk…there, it’s out in the open. And now that it has been acknowledged, perhaps we can move beyond the knee-jerk reaction and discuss how risk is controlled, or in legal terms, mitigated. Because as scary as risk may be, nothing is more terrifying than finding out your plan to control that risk is inadequate or outdated. This article will explore why risk is such an ominous topic for recreation professionals, what the current standard is for mitigating risk in campus recreation, and where the legal decisions are trending with regard to mitigating risk. In Part I of this article, we discussed the risk assessment tool developed by Peter Sandman dubbed the “Outrage Model.” In the Outrage Model, Sandman defines risk as hazard plus outrage. Applying this model to risk in campus recreation, we can assign hazard as the objective factor, such as the safety of a playing surface or wear and tear to equipment, and outrage as the subjective factor, such as the criticism and emotional reaction to these hazards. These criticisms and emotional reactions have lead to an increase in litigation and a paradigm change regarding assumption of risk. In Part I, a table showing which jurisdictions are likely to uphold a waiver or assumption of risk clause and which are not was produced. In this article we will outline how to move away from legal jargon and develop an effective, dynamic waiver document. 1. Why is Negligence such a Big Deal? Who Needs to be Trained? 1. 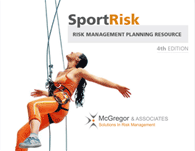 Risk Management: What’s it all about? In today’s litigious society, can you afford not to have this book? Across North America, Sport Clubs continue to be a major ‘sweaty palm’ issue for most Campus Recreation departments. Student-run Sport Clubs can provide an excellent learning environment for student leaders. However, from the administrator’s perspective, too many Clubs are just ‘doing their own thing’ with few controls in place to minimize problems. Hence it is all about finding that balance between freedom and control. Many Sport Clubs operate with a fair degree of autonomy. However, the bottom line (from the Court’s perspective) is that Sport Clubs will likely be deemed to be ‘part of the University’, since they compete regionally and nationally as a ‘University’ team. Therefore the University will likely be held responsible for Sport Club activities (as these relate to practice and competition as well as travel, fund raising, social activities, etc.). Hence it is important that Campus Recreation departments effectively manage Sport Clubs to ensure that (a) the risk of participant injury is minimized and (b) a costly lawsuit is avoided. The solution is to implement a ‘framework’ for managing Sport Clubs which provides flexibility on how to implement various Sport Clubs policies and procedures, yet incorporates some ‘bottom-line’ or ‘non-negotiable’ requirements which need to be followed by Sport Clubs.